As the year comes to an end, it’s nice to look back. It has been a cray-cray year for me and I haven’t had the chance to sit back and reflect as much as I would like. Honestly, I have been kind of beating myself up that I haven’t made more time to blog this year. But looking back through all my posts I realize that I have written a lot (between all my blogs). I picked these 10 blog posts, not because they got the most likes or view, but because I liked them and thought they might be the most helpful to you. For me, 2015 was a transitional year. I lost some friends and two grandparents. There were a number of family and friends that were very sick or dealing with difficult situations. I’m grateful that things are settling down. 2015 felt like the end of one era and 2016 will be the beginning of another. I’m really ready for this new year. Let’s make it great. Jonathan and I had fun exploring the motel installation on Sunset Blvd. yesterday. It’s a temporary art piece by french artist Vincent Lamouroux, supported by Please Do Not Enter. He whitewashed the old abandoned, derelict Sunset Pacific Motel and the landscape/palms with a lime wash. It’s pretty striking on its own, but there will also be some sort of projection on it April 26th. It was like a shimmering ghost of Los Angeles past. A cathedral to the Boulevard of Lost Dreams. An architectural model before it was ever built. A party inside a memory. I was most struck by the white palms. They were disturbing and iconic. And were both great looking and fake. And made me think of fake palms they use in malls and in projects in the Middle East and China. But they are real. And probably full of rats. And we love them. The white was gleaming and I wish I had my sunglasses. All the shadow play on the building, the textures of the palms, fence, barbed wired reminded me of a textile or tapestry. Stitching. We were there just before sunset and the light was bright and shifting rapidly. The folded leaves of the fan palm. It must have been difficult to paint them with the lime. The artist took the shittiest building on that stretch of Sunset Blvd and make it something for Angelinos to be proud of. A peek through the fence at the inner court yard. I think this is where the projection will be on Sunday. I was disappointed that the LA trash bin was not painted white. That would have been a great detail. Everyone was craning their necks to take in the signs and palms. Strangers on the sidewalk were talking to one another and discussing art, theory, city planning, Los Angeles. It was kind of amazing. But I couldn’t help but think about the other people who once stayed here. People who picked up Route 66 in Illinois or Oklahoma and who followed their dreams and Route 66 as it turned into Sunset Blvd. and who took a right and pulled into this parking lot looking for a room. Welcome to Los Angeles. There is also this stage like quality about the place. You feel like you are on a set. Everyone is striking a pose. Instagramming. The dress I’m wearing is by Osklen, a Brazilian brand that does edgy resort wear. And fittingly, I guess, the motel is going to be torn down soon to make room for condos soon. It was the developer who made the property available to the artist. LA is getting denser. It needs to get denser. And it is critical that we remember the ghosts of the past, as we decide what to keep and what to let go. At long last, the Fountainebleu! 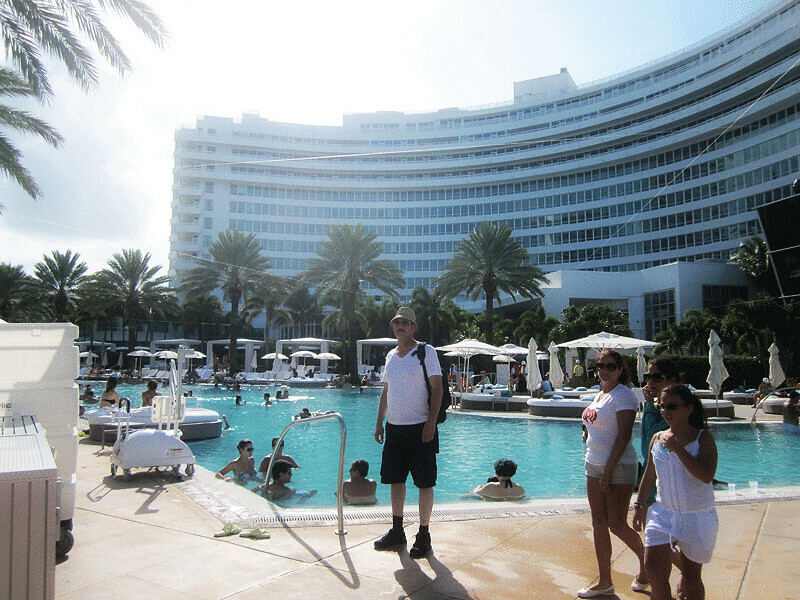 The Fountaineblau hotel is one of the most historic and architecturally significant buildings on Miami Beach. It was designed by Morris Lapidus and opened in 1954. It was completely fabulous in a way that horrified the architectural establishment at the time – but the public got it and loved it. Plus, over the years it has been featured in a number of films, including Scarface and Goldfinger. Morris Lapidus is a maximalist modernist through and through (in Europe they call this style “googie”). His autobiography published in 1996 is called Too Much is Never Enough. Brass seahorse door handles on the main lobby of the Fountainebleau. The seahorse also represents the “F” of Fountainebleau. Also note the signature bow tie marble paving in the lobby. The bow tie form was a signature of Lapidus, and he used the shape in a variety of ways in different buildings. A field of circular windows on the front facade of the hotel create an under sea/under water feeling of floating in light bubbles in the dappled light of the convention center lobby. I found it irresistible, even as an adult, to dart about and play within the light “bubbles”. Note: I called them “bubbles” but Lapidus called them “woggles” and “cheeseholes“. In 2008 the hotel re-opened after a two-year, 1 BILLION dollar renovation. The original paving remains in the lobby. A new chandelier echos the”woggles” and “cheeseholes” in the adjacent space. And a new tryptic of James Turrell pieces can be seen behind the front desk. 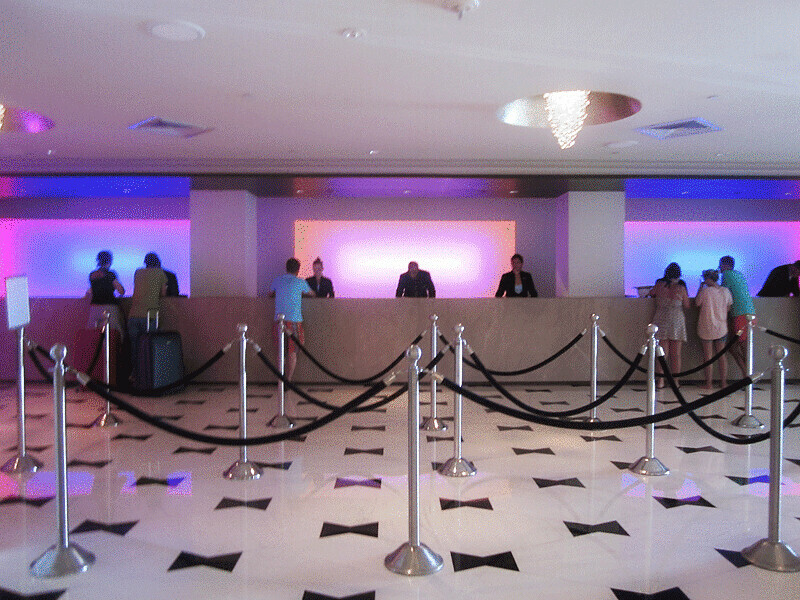 My friend, Brant Ritter of Thoreen&Ritter installed the series of light pieces for James Turrell at the Fountainebleau. An artist, furniture designer, restaurant designer, etc. he has a cool side gig of being one of the very few people James Turrell trusts to install his work. So Brant gets to jet off to fabulous places like Tokyo or the Fountainebleau to play with light. There are three light sculptures behind the front desk, and several more groups of them along the hall to the main lobby. In the main lobby there are additional light pieces behind the concierge. 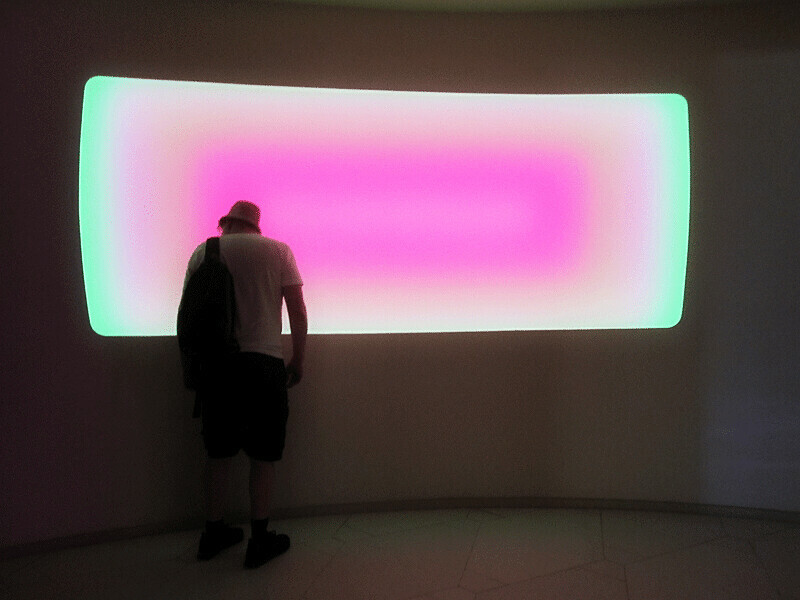 Jonathan checking out one of the Turrell pieces. It is hard to capture the color. It slowly morphs from one color palette to another. 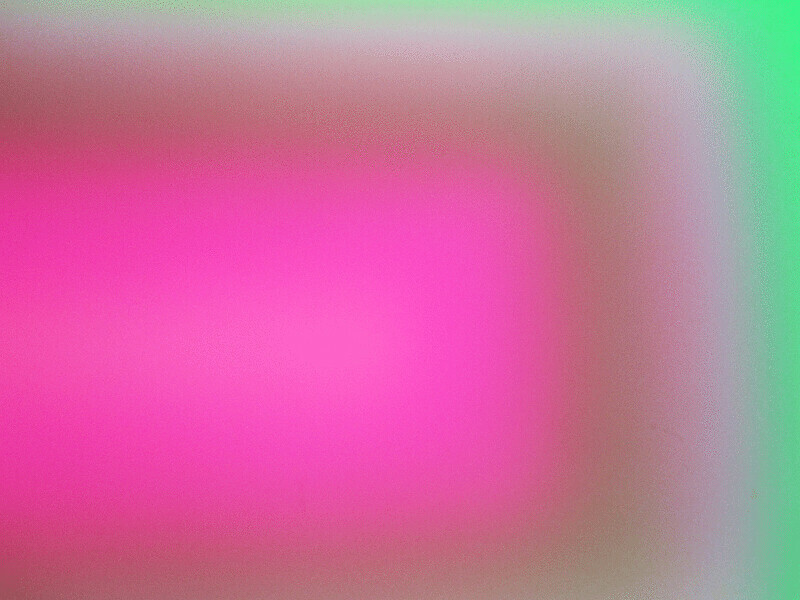 This is a detail of the light sculpture and the color in this photo is more accurate to how it looks in real life. More light sculptures. I love how the light reflects off the marble floors and makes the whole space change color. Jonathan luxuriating. The famous “stairway to nowhere” is in the background. People watching in the main lobby. I love the custom carpets. The iconic curved shaped facade from the beach side. The huge new pool was part of the renovation and is shaped like a bow tie in honor of Lapidus. 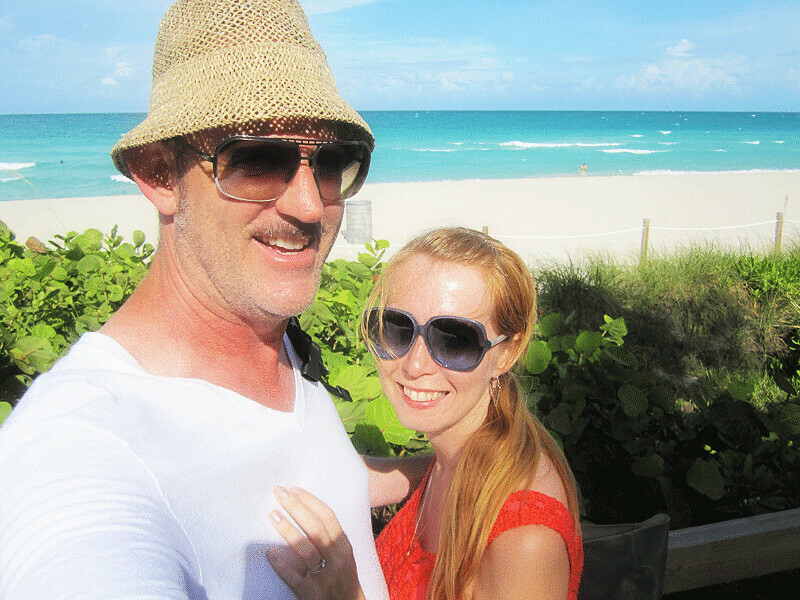 On the boardwalk at the Fountainebleau, soaking up Miami Beach. + Can’t wait to visit more Lapidus hotels! I had a good time. Thanks a million Morris.